A gorgeous and juicy peach shade is perfect for any and all of your summer creations. 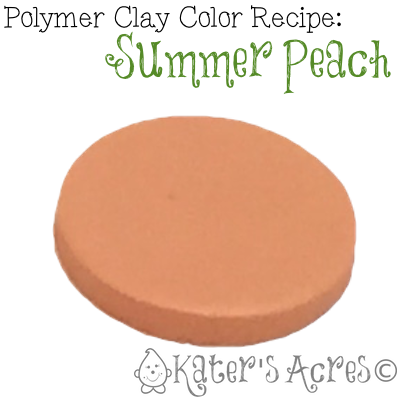 This polymer clay color recipe uses my favorite, Premo! polymer clay. You can likely adapt it using similar colors for Sculpey III as well. You can’t just add white to orange and get peach, you get light orange. The pink (blush) color and the gold help bring a vibrant peach to life. This color recipe uses prepackaged colors of Premo! clay that are readily available, even in the big box stores like Hobby Lobby, Pat Catan’s, & others. Don’t forget to grab your FREE polymer clay recipe card download HERE to help keep track of your blends. Make a simple ombre bead necklace. Start with this base color. Take ONE portion, add 2 more parts white. Take another portion and add 1 part black. This will give you a tint & a shade for a cute & whimsical 3 bead necklace.